Benford’s law states that in many naturally occurring collections of numbers the small digits occur disproportionately often as leading significant digits. For example, in sets which obey the law the number 1 would appear as the most significant digit about 30% of the time, while larger digits would occur in that position less frequently: 9 would appear less than 5% of the time. Since statistical and financial data often obeys the Benford’s law it is a widely accepted fraud detection method to compare the distribution of leading digits with the theoretical distribution. 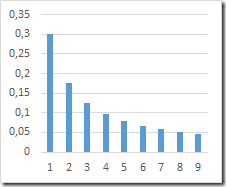 Fortunately it is pretty easy to implement the Benford’s analysis in the OLAP cubes. 2. Now let’s assume that we want to analyse the SalesAmount from Reseller Sales. Don’t forget to define a regular relashionship between Dimension “First Digit” and the correspondent measure group in cube using the key SalesAmount_FirstDigit. We take the measure [Reseller Transaction Count] as base value for our statistics. 3. We define the calculated measures to be able to compare the distributions visually as well as to run a statistical assessment formally (using Kolmogorov–Smirnov test). Please see the inline comments for details. // if you want to analyse another measure group. as // Use constants for performance! 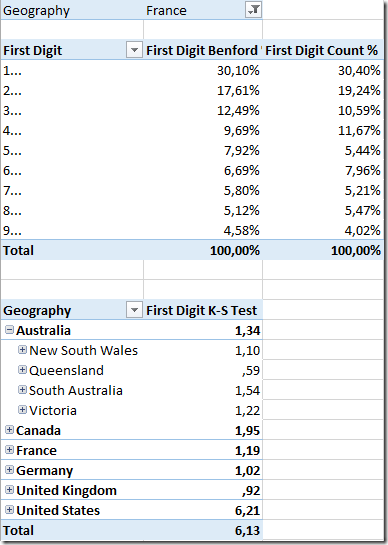 The larger the “K-S Test”, the more probable that the data does not obey the Benford’s law (see table of critical values here). 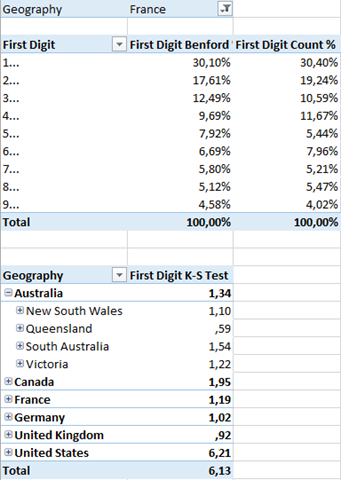 Here the data for France shows a pretty good fit (K-S Test = 1,19). The MDX here is not performance optimized. 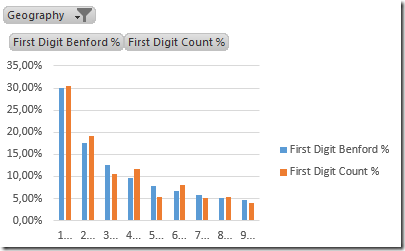 You can start with using precalculated constants for [First Digit Benford %]. You can make some of calculated measures invisible. For instance cumulative ones. Here we made only one measure available for Benford’s analysis. 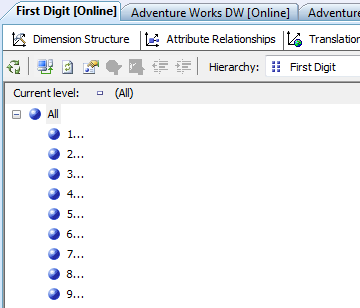 To analyze further measures/columns you have to define more keys for dimension First Digit in your tables and add a selector dimension for the [First Digit Count] (unrelated to data) and do the switching in your cube script. 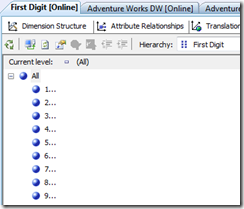 If you have more than one measure/column to analyse per measure group, you have to define a role playing dimensions based on the dimension First Digit. Of course you don’t have to expect, that every data obeys the Benford’s law. Please refer to the corresponding topics and go through references here.